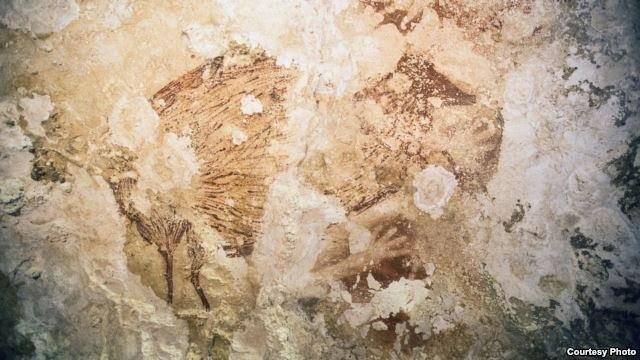 The ancient cave paintings in Indonesia is as old as the famous prehistoric art in Europe, according to a new study, which suggests that human ancestors made ​​the image all over the world 40,000 years ago. And it indicates the modern human creativity (which is rooted in Africa) was more earlier than scientists previously estimated. Archaeologists calculate that a dozen of the red hand stencil images and two detailed images of pig-deer was described as aged between 35,000 to 40,000 years, based on the rate of uranium decomposition. It puts the artwork found in Sulawesi in a period that is approximately the same as the pictures that found in Spain and a famous cave in France. 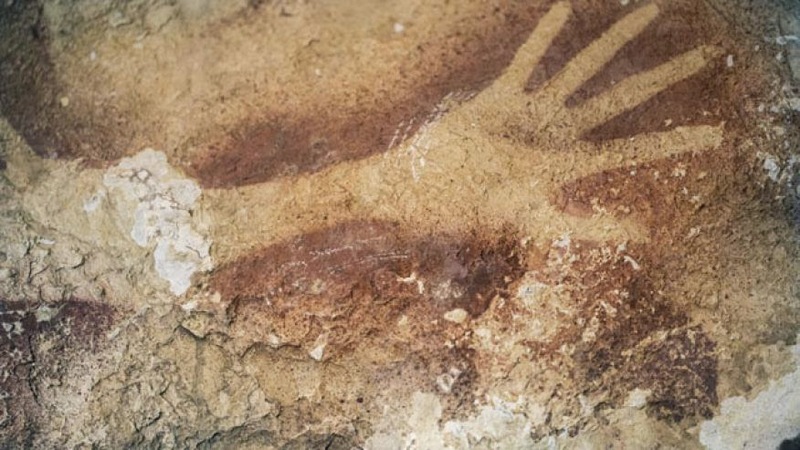 And one of the hand image in Indonesia, it is estimated at least 39,900 years old, now is the oldest hand stencils image known to science, according to a study published on Wednesday, October 8, 2014 in the journal Nature. 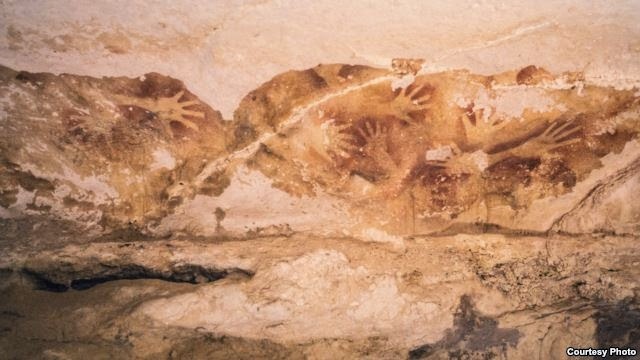 There are more than 100 the cave paintings in Indonesia which has been known since 1950. In 2011, scientists saw a strange rock formations in the paintings called "cave popcorn". Deposits of these minerals can allow researchers using the uranium decomposition technology to determine how old the artwork. So they tested the outcrop, which grow on the image to determine the minimum age. It turned out almost 40,000 years old. "Whoa, it was not expected," recalls study lead author Maxime Aubert, an archaeologists and geochemists from Griffith University, Australia. Looking at the cave paintings, the details in the image of the beast "It was made with a very, very good," Aubert said in a telephone interview from Jakarta. "Then when you look at it in context that it's really 40,000 years old, it's amazing." John Shea, a Paleoanthropologist of Stony Brook University, New York, who did not participate in the study, said the findings are important and can change what the science know about human and prehistoric art. Prior to this discovery, the experts have a Eurocentric view of how, when and where humans began to create works of art, according to Aubert. Knowing when art begins is important because "it defines us as a species," he said. Because the art of Europe and Asia were basically the same age, it means the art evolved separately and simultaneously in different parts of the world or "most likely when humans left Africa 65,000 years ago they had evolved with the capacity to create paintings , "said Aubert. The ancient art is not commonly found in Africa due to geological conditions do not preserve it well. Shea and others tend to agree with the earlier art theory. "What the present invention is that when humans began to move out of Africa, they are not too different from us in terms of the ability to use art and symbols," said Shea.